Registration is now open for Google Code Jam 2008. Programmers ready to use their coding skills, creativity, and ingenuity to solve a series of challenges can register at http://code.google.com/codejam. The top 500 contestants will win an all expenses paid trip to the semifinals at regional Google offices, with the top 100 advancing to the grand final at Google's Mountain View headquarters. Disney World in 3D -Incredible! 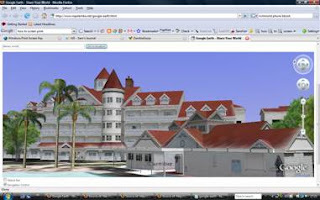 Go to http://www.mpelembe.net/google-earth.html and enter Disney World in the searchbox. Check the navigation control option box and zoom in as far as possible. Enjoy the ride! More options have been added to Mpelembe Google Earth Application including navigation control. To view and use the navigation controls check the Navigation Control option box. This tutorial describes the basics of navigating the globe within Google Earth.